International Journal of Novel Trends in Pharmaceutical Sciences,2013,1,1,9-14. 1Assistant Professor, Ananthapur Medical College, 2Prof & HOD Kurnool Medical College, Andhra Pradesh, INDIA. Background: In India, majority of the population, including the elderly, is poor. However, one positive feature concerning the elderly population is that most of those 60 or more years old are economically active, presumably because they are engaged in sectors for which there is no specific age of retirement. Objective: Factors Influencing Hypertension among Geriatric Population in the Field Practice Area of Kurnool Medical College. Materials and Methods: A community based cross sectional study was conducted from May 2008 to April 2009. A total of 490 subjects aged 60 years and above were selected by randomly from both rural and urban areas for this study. The data was analyzed by means and proportions. The data was analyzed by means, proportions. Results: The proportion of subjects falling in the age group of 60 – 69 years was 56.33% in urban areas and 55.10% in rural area. 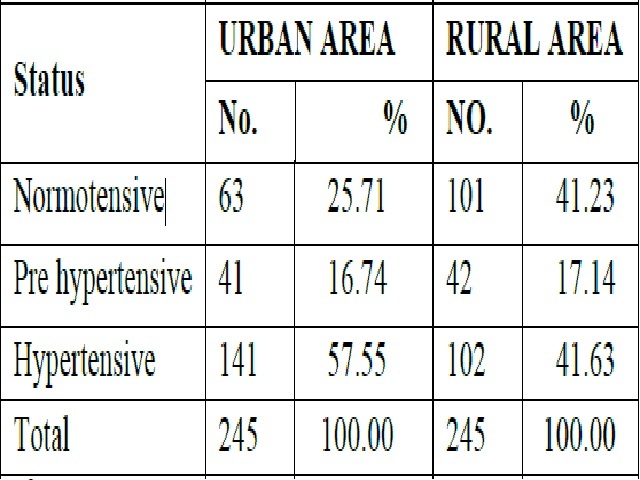 While 10.09% males and 19.05% of females of the subjects from rural area falling in 80 – 89 year age group compared to 6.84% males and 7.81% females in urban area.